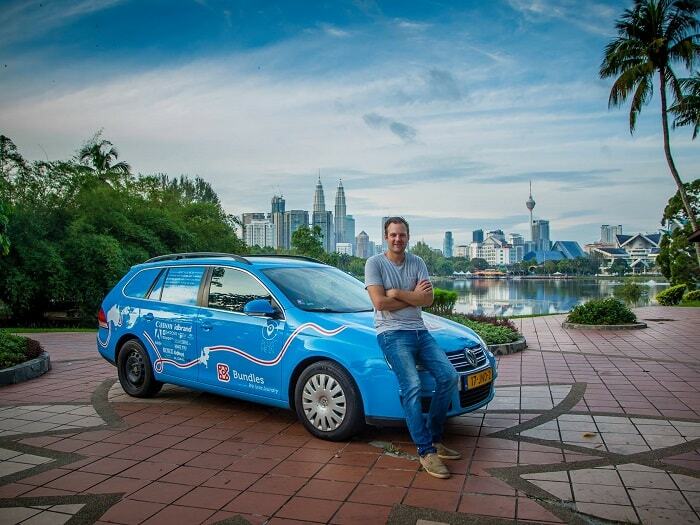 Wiebe Wakker is driving from Netherlands to Australia in an electric Volkswagen without money and now he is in Indonesia, seen in this picture with that iconic, Kuala Lumpur skyline. He is driving a retrofitted VW Golf. "For almost 2 years I have been living an unbelievable and crazy dream: driving from the Netherlands to Australia in an electric car. Without money, but fueled by the energy and generosity of strangers around the world. In 687 days I saw 31 countries and drove 60.000km (37,282 miles) without going to a gas station! I am now in Indonesia and not far from the final destination. Follow Plug Me In to see if I will make it to the other side of the world," writes Wakker. Here is the Video Wiebe shared on his Facebook page. "Made a short overview of my little road trip so far. In almost 2 years I saw 31 countries, drove 60.000km and never visited a gas station! Crazy when you think of it," Wakker writes. and asks if he will make it to the other side of the world. His trip hasn't been easy and he has a laundry list of problems. - To make matters worse, there was also a short circuit in the garage, causing the charger of the car to explode. Result: he could only continue on a slow charger and had to fly a new charger from the Netherlands. In spite of all these problems, electric driving through Southeast Asia eventually came along, he continues. "Electricity is actually everywhere, which is why it's quite easy to drive an electric car in countries like Myanmar and Malaysia, but you can go to any gas station," Wakker says. Have you done any long trips similar to this with you EV? Please share your experiences in the comments section below for discussion.